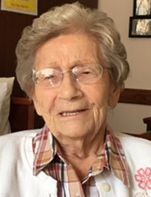 Troy - Lillian M. Warren Coulter, 94, of Blooming Grove Drive died Friday, August 17, 2018, at Van Rensselaer Manor after a long illness, surrounded by her loving family. Born in Troy, she was daughter of the late Clyde Warren and Marie Bliss Warren and wife for 42 years of the late Robert C. Coulter who died in 1991. She was raised in the Albia section of Troy and resided on Route 2 in Grafton for 40 years and was a graduate of Troy High School. Mrs. Coulter was a homemaker. She loved to dance was a member of the Uncle Sam Sparklers. She was a member of the Center Brunswick United Methodist Church and its Women's Club and a member of the Order of the Eastern Star. Survivors include her children, David (Ann) Coulter, Whitehall, Dale Walsh, Clifton Park, Diane (Stephen) Deets, Schaghticoke, Dawn (Gregory) Scott, Henderson and Donald (Kimberly) Coulter, Saratoga Springs; a brother, Lester Warren, Mesa, AZ; 15 grandchildren; 18 great grandchildren and 2 nephews. She was predeceased by a brother, Merrill Warren and a son-in-law, Richard Walsh. Relatives and friends may call at the Bryce Funeral Home, Inc. 276 Pawling Avenue Troy on Monday, August 20, 2018 from 4-7 PM. Funeral service will be held Tuesday at 11 AM at the funeral home with Rev. Joy Lowenthal, officiating. The family would like to thank all the staff of A3 at the Van Rensselaer Manor. In lieu of flowers contributions may be made in memory of Lillian M. Coulter to the American Heart Association 4 Atrium Dr #100 Albany, NY 12205.